I am no one special, just an ordinary dude that strives to be the best version of myself. I am currently 30 years old, a husband to an amazing wife, a father to an amazing boy, and a proud puppy papa to two toy breed dogs. I live in the foothills of California and love it here, this is truly where I wish to live out my days. 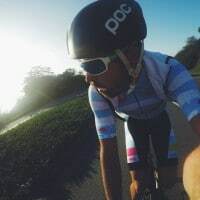 I started cycling as a cross training activity for Brazilian jiu-jitsu back in 2010 but it quickly took over my life as I fell deeper into the crazy sport of cycling. I am a cat 2 NCNCA racer, which took me 3 years to reach. As for being vegan, it has been a 10-year journey into health after eating fast food 3 times a day, EVERYDAY. Caryn Hartglass: Okay, Everybody, that was a nice little break. I like kind of rockin’ along with the music. And I have mentioned this in a long time; I’ve been playing the same intro, and outro, and break music for 7+ years now that I’ve been doing this program. And I’ve been sticking with it, because it was written for this show, by my very talented brother, Barry Hartglass. More about Barry Hartglass at barryhartglass.com. But, I love this music, and it always keeps me light and humorous and inspired to get into the second part of the show. Here we go. So my next guest is Tyler Pearce, the Vegan Cyclist. And I’m just going to bring him right on and he can tell you, he can tell all of us more about him. Tyler, Welcome to It’s All About Food! Tyler Pearce : Well, Thank you so much for having me. Caryn Hartglass: You’re welcome; you sent me your bio, which is on our website: Responsibleeatingandliving.com. And it starts out “ I am no one special, just an ordinary dude that strives to be the best version of myself” That’s beautiful, and I think you are special just for that. Tyler Pearce: Well Thank you. You know the thing is, I came from, I was raised not to be vegan. I was not in a special family that attributed food to health or anything of those sorts. That’s kind of what I mean. I’m no one special; I’m not some crazy scientist that has done a ton of research and came across vegan as a lifestyle. It just sort of happened naturally, which is sort of a weird trajectory for me, because I was such a meat and cheese type of guy. I didn’t like cyclist, I would see someone on the road, in the tight wear, in lycra, I would just laughed at them and think that was so stupid. If anyone said that meat wasn’t absolutely the only way to go, I just thought they were crazy. Fast forward a couple years, it’s such a transformation. Caryn Hartglass: Oops, you’re on the other side. Somebody’s laughing at you now. Tyler Pearce: Totally. But, The thing is, when my wife and I decided to have a kid, it grounded in that she is going to create a human being out of food. That is what she’s going to do. She’s going to eat things, and she’s going to make a human. We thought we want our human to be created out of things that are not McDonalds and Burger King and that sort of thing. And so it’s just this very slow transition of: let’s cut out fast food, let’s buy organic, let’s buy locally raised animals. We had this idea that we’re super healthy, we’re the healthiest as we can be as we’re still eating meat and consuming lots of animal product. We just thought we’re doing a very sustainable and better way. And then we just accidently watched Food, Inc. that changed the way you look at it. It just snowballed. The more education you get, the more it’s hard to turn away. We’ve gotten some chickens. We live in the mountains. I live just below Yosemite National Park. We got some chickens because we want to have our own eggs. When we got them, they were baby chicks, day old baby chicks. Just holding them in my hand connected those dots, even though you know when you’re eating chicken, it was an actual animal. But you never actually experienced that animal, it’s just strange. Tyler Pearce: It was literally a flip of a switch. I woke up, and I ate a bunch of yogurt and eggs, and after watching this one youtube video, that was it. It was completely a flip of a switch. I’m super thankful that my wife is super onboard. She was instantly vegan too. That was really cool. Caryn Hartglass: You are very fortunate because this switch does not click at the same time for most couples. Tyler Pearce: Yea, I’ve always thought that has to be so difficult for someone to want to live a plant-based lifestyle. The significant others, their family, I have kids that watch my YouTube videos. And there’s one story that’s really cool. This kid, he’s 13 and he messaged me and said “ Hey, I watched your videos and I’m really inspired, and I want to be vegan but my Dad say he shouldn’t because it’s not healthy and it will stunt my growth. Is there anything you could do to talk to him”? That was so crazy that this 13 year-old kid changed his Dad’s live. Now they’re primarily vegan, they’re not 100% but they definitely have cut out most of their animal consumption, which is a good win. Caryn Hartglass: Wow, That doesn’t happen all the time, but when it does, it’s incredible. I like to think that we are here to learn from those who are older and wiser, and also from those who are younger and wiser. You mentioned accidentally seeing food Inc. I don’t think it was accidental. I don’t believe there are any kinds of coincidental. I believe you saw it because the time was right. It got to you. I also think that there is something innate within us that is truly compassionate and understand the preciousness of all lives on earth. We have learned through generation so it is coded in our DNA somehow, to put up walls around us and separate from other beings. It’s not healthy literally for us to eat other non-human animals, but from spiritual standpoint too, it’s not emotionally healthy. Tyler Pearce: I can’t remember who said it, but if slaughterhouses had glass walls, we’d all be vegetarian. Caryn Hartglass: I don’t know if all of us would, but I think a lot of us would. Tyler Pearce: The thing is, I have so many friends, and I know that they are compassionate towards animals. I know what’s in their heart if you will. They wouldn’t want any animals to go through what they go through. I know that they don’t want the world to be destroyed through the way that factory farming is doing. But for some reason, there’s a huge disconnect. I actually ask my friends this question yesterday. They always give me a bunch of crap. They sent me this funny anti-vegan meme and it was just a funny little video making fun of vegan. And I was like, that’s funny, but what is it about this that makes you feel that this is not good. If you know it’s bad for the animal and the planet, what is it really, what’s the reason for you from entertaining the idea? Most of them think that they don’t think their one decision could make any difference. But that was really it, they conceded that they were some issues with the current system, but they couldn’t really make much of change. I thought about that a lot. That’s OK if you’re talking about Voting for politics. Coz you’re only going to vote once every four years. It’s easy to think that my vote might not count. But if you decide to go plant- based. You vote multiple times a day by eating. So that put out over how many years you didn’t continue to do that. One person can absolutely make a change. Even if it’s not 100% Vegan. Even if you reduce 10%, 20%, whatever it is, if you make any good changes, good habits build good habits. So if you can slowly start to make those changes, you make a difference. Every person makes a difference. Even to just one chicken’s live. Caryn Hartglass: Absolutely. It’s interesting you bring this point up about your friends that they didn’t think they could make a difference. Because I opened a program saying just that. I felt the need to repeat that idea. Change only happens by individuals. 1+1+1 all of us individuals, little drops that filled the buckets. That’s the only way change happens. The Government is not going to make a change until it feels the momentum from the people wanting the change. We have to do it and each one of us absolutely makes a difference. If you look back in history, you can see that happening. The changes that have been made for the good have only happened from individual activist spreading at a grass-root level. Tyler Pearce: absolutely. I think that you can see there’s sort of a movement towards accepting Veganism more. I know that in the cycling community, most people when they start their research, in endurance sport, recovery is a big hurdle. If you can recover better, that’s a big advantage. And usually a plant-based diet, if done right, will offer you better recovery than a meat-based diet. So a lot of people are starting to go that route. When I go to a race, and there’s 5, 6, 7 guys in a group there are vegan. That makes the other guys think; obviously if they can do it or if I’m getting beat by vegan. Not saying that I beat a lot of people but there’re some strong vegans out there that changed the idea that if you’re a vegan then you’re some weird hippie, and you have no energy. I don’t know where that idea comes from but I think it’s changing for sure. Caryn Hartglass: We have to thank Brendan Brazier a lot for that because he’s been in the forefront especially with cycling and running, talking about recovery with a vegan diet, and building strength, because the recovery period is much shorter on a vegan diet. It enables you to train more and train harder if you choose to do that. I love the book that he’s written. He explains it in a way that’s, pardon my pun, easy to digest. Tyler Pearce: Absolutely. I think it’s really difficult sometimes because it’s such a broad topic. It’s so hard to approach this with someone in a bite size pieces. It’s hard to bring it up over just a coffee. It needs little tidbits that got dropped over time that allow someone to make the connections between everything. But, a lot of it, I want to say, it’s sort of indoctrinations. That kind of sound likes a harsh word, but if you grew up with the idea that this is how it is and you see TV Ads that says this is how it is. You just assumed that’s just how it is. With my son, he’s 5 years old and I went vegan when he was about 3 years old. I didn’t want to force anything on him, I didn’t know much about it. I always say it’s better to be 90% vegan for life than 100% vegan for a year and then you just fall out it. I just let him make his own decision. He saw what we were eating and lead by example. I never really talked about it. So we went out to dinner 2-3 months into our vegan changed. He said he wanted chicken. I was like that’s fine, you can totally do that. But I just want you to know what it is that you’re eating. We had chicken at the time, so we showed him our chicken, Luke, Our rooster. He said, “ No I don’t want that”. I was like; “ well that’s what this is. They just have to kill the chicken like our chicken so you can eat it” He said, “I don’t want our chicken. I just want to eat chicken, not kill a chicken.” And I said, “ There’s no other way around it.” And so he just said I’ll just eat something else then. It’s so crazy to see a 3 year old make that connection and be able to make a decision that seems so easy and intuitive without all of pressure from years and years of people telling you that you have to eat meat to be healthy, you have to drink milk to be healthy. Caryn Hartglass: I’m thinking of so many things since you brought that up. Your son wanted to eat what he called chicken, which was something that he enjoyed eating. It was tasty. But he didn’t want to eat another living being. That was natural to him. Especially one that he cared about, and struggled to realize that the two are one and the same. People struggled to do that too, and that’s where so many things come into play like, all this meat analogs today, these companies that are using plant ingredients to “make” chicken without the bird. People can have foods that they liked eating without the animal in it. I think that’s one part of the 20th century. That’s the good thing where we’re going. Good for your son! I want to go back to when you’re talking about your friends and the meme that they sent you. A lot of people struggle with dealing in social circles with their friends, at the work place. Very often, people feel a need to egg you on, and send you stuff that they think is funny, but what did they feel the need to send it to us? It’s not funny to us. But there’s something in them, I think, that want to engage on the subject. Tyler Pearce: Right, I think there’s always curiosity. Before I went vegan I remember I had met someone and she said she was vegan. I asked her a bunch of questions and I was curious. When I look back on it, I wasn’t really interested in the answer but I was trying to provoke or cause some kind of stir. The more that I get those things, I always want to keep it light hearted and just make fun of myself and say that I’m crazy hippie, that I’m earning my level 7 vegan badge, but then, over time it sort of gets frustrating. You send these things to me, and you keep making fun. This one I Didn’t asks them: Why wouldn’t you ever consider this? And the answers are very not grounded in sort of science or grounded in any conviction. It’s just “ I don’t know, it’s just kind of what I do” But, the thing is there are a lot of people out there that sort of give a vegan community a weird name or just make it not look very appealing. When I first became vegan I was so excited, I wanted to wear that badge on my chest, I was so proud and I went to a couple vegan forums, and I wanted to talk about it, as we all do, when we got really passionate about something we want to talk about it. When I first started going to this forum I saw vegans being very mean and degrading to each other. I saw this person that goes “ I stopped eating chicken, beef, I added more plants in my diet, but I can’t quite get over fish. I still like to have fish” and instead of someone saying “ Hey, fantastic job” they all said you are horrible, why wont you stop eating fish. You’re a murderer. You can’t do that. Every little win needs to be celebrated. I know that other people are further along in this journey than others and so my friends come in contact with these very vigilante almost vegans, no matter what you say, you’re a murderer. If they can’t really have decent conversation with someone, that’s when they put up this defenses as jokes. They pass jokes along because they don’t want to get in the subject. They just want to have it be something funny, and not realized or turned their attention to what it is they’re actually participating in. Caryn Hartglass: Yes, sometimes I like to say on this show: Tuned in live. And instead of tuned in live, I ‘d like to say tune in love. The answer here, and with everything, is love. We need to treat everyone as ourselves with love, with respect, with kindness, with compassion. That ‘s the only way we can really come to common ground and have people hear our message. Oh Well. Okay, so now tell me about the cycling. We lost Tyler. And I hope we find him again soon. Sometimes we Skype with our guests and as much as I love the internet, I love technology, sometimes it fails us and we can’t connect so I hope we reconnect with Tyler soon. Because I want to find out how he got into cycling. Now, I do now that when you make a transition to a healthier diet and you start to feel healthier. Everything else just falls into place, and many of us want to get more physically active. But some of us find we have so much energy that you got to do something with it. That’s exercise. You want to feel better and it’s just fun. Being able to romp and play. I know that I got into bike riding. I don’t ride as much as I would like to now because I live in a place where it’s not bike friendly. It’s just hard to do. Which is unfortunate, so I have to get my bike out of the garage of my apartment building, and I have to bring it back up and pump up the tires and take it out and I wouldn’t even ride around here. I have to walk it carefully to a park where I feel safe because there are these monsters driving cars outside. So, I dream of a place where I can go and ride my bike where it’s just peaceful and safe. Gosh, I hope we get Tyler back because I wasn’t done talking to him. Maybe we won’t find out why he decided to cycle. Who knows? Ok, so I did mention a few weeks ago and it’s still holds true anytime anyone has any questions you could call and ask them 1-888-8744-888. There’s only a few more minutes left but if you are burning with a question we’d love to hear you. Otherwise info@realmeals.org it’s a place to find me. I’m so thrilled when people comment and ask questions and we have a conversation. That’s lovely. And it looks like Tyler, are you back? Caryn Hartglass: Skype is a beautiful thing but it’s not perfect like us. SO my question for you was how did you become a cyclist for somebody who doesn’t like wearing the stretchy pants? Tyler Pearce So I was into Brazilian jujitsu. Which is sort of like wrestling but with submission. I own the motorcycle business. I sold dirt bikes, street bikes, and was living the American dreams. I had few houses and had a huge (?) truck. I had all these materialistic stuff and I lost the business and I lost everything I got really kind of fat. Food was the only thing that was giving me any sort of happiness at the time. And just looked in the mirror one day, and oh my goodness this is not who I am. I started try to loose some weight and I got into Brazilian jujitsu which was super awesome. I started teaching kids, and I dove into that. As I crossed training things, I wanted to be more fit for jujitsu; I got a bike and I start riding around. I don’t know I just got bit by the bug I guess, because then my cross training became everything. I just really enjoyed that. I don’t really do a whole lot more jujitsu. It’s all about cycling and it’s just something that I really love. I love the whole sport, the community, everything about it. Recently just this last weekend, me and my son went down to a race in Bakersfield and it was super cool just me and him doing boys road trip and he got to do a little kids race, and I got to do my race, and we hung out. It’s really a thing that can bring people together and pulled together. To segue into veganism, you had say something about spirituality and if you eat meat, there’s no way to understand this. But once you stop putting that in your body, you feel more connected with life. If you’re connected with your body and more connected with life, there is this whole other feeling, level of happiness or joy that goes beyond how good they can taste. That’s what a lot of people say. I could never be vegan because “mmm, Bacon” and I totally understand that. That it is delicious to you at that point in your life. But when you feel great and there’s elevated state of existence that I promise feel better than how meat taste. Caryn Hartglass: Especially with coconut bacon and so many other plant version of bacon that have that same sweet, salty, fat, smoky chew. It comes pretty close. Tyler Pearce: I’m not a huge fan of the replacement. I think it’s great for someone who wants a bacon burger, and they want it to look exactly the same. But to me, I’d rather stick to whole foods things that come from nature: potatoes and broccoli and rice and beans. We occasionally do a black bean burger, but my wife was just looking at something: you can make a chicken leg out of aquafaba and it looks just like a chicken leg. It’s kind of repulsing to me. It doesn’t seem appetizing. I don’t even know what really that is. I know to someone who just absolutely needs to have that fried chicken. There’s where it seems like there’s a polarization or quite a difference of people in the vegan community, one side is 100% ethics some side is 100% health. Caryn Hartglass: Okay Tyler we have 20 seconds left. I just want to say thank you for joining me, and thank you for making the choices you did, and you’re awesome. We have to tie up the program here, I’m Caryn Hartglass and my guest is Tyler Pearce, The Vegan Cyclist. And you can find me at responsibleeatingandliving.com. And remember, have a delicious week! Great to read your story, my turning point to go vegan was one evening at dinner my wife and cooked a chicken snitzel burger for dinner and i went to eat it but could not take a bite, my body was saying to me enough is enough, no more meat. I knew that my body was telling me that eating meat and dairy, eggs was not the right things for my body. We have been eating a plant based, whole food nutrition plan now for six months and have never felt better, We both train at the gym four times a week and ride our bikes three times a week as roadies.